It was Jeannette Kittredge Watson, wife of IBM president Thomas J. Watson, who suggested the need for a special device to permit bedridden and other incapacitated people to use a typewriter. 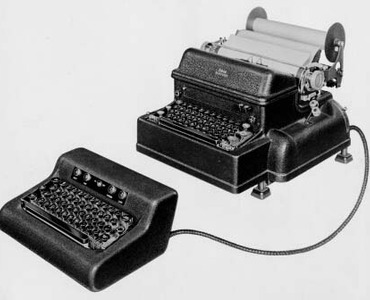 In response, IBM engineers developed a prototype (shown below) that used a remote control keyboard to automatically reproduce typed text on an attached IBM electric typewriter. An experimental model -- tested at the Bronx Veterans Hospital, in New York City -- used paper on a continuous roll to eliminate frequent changes of single sheets. This handy machine enabled partially paralyzed patients who were confined in bed to use just a keyboard -- positioned, say, on their laps -- to produce a series of documents simultaneously on a nearby typewriter.